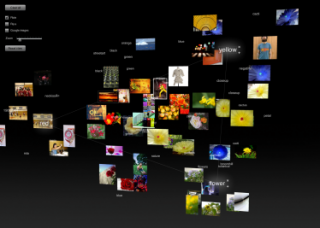 3D Photo View is a new intuitive image browser for viewzi.com. Viewzi is a new and highly visual way to search. Being one of the search options, 3D photo view is a whole new approach to image search, allowing you to place several searchfields in a 3D space. The image results will get arranged around and between the searchfields. The engine also displays images related to several searchfields and related tags. Programming in Flash ActionScript 3/Papervision. Concept and design in collaboration with WHITEvoid. Commission, production and art direction by WHITEvoid.